We are so honored that Mrs. Patricia Barnes is a member of the OPUS Faculty. She is a seasoned, well-rounded musician with specialties in piano, organ, handbell conducting, and chamber music coaching. She is also a wonderful human being. We cannot say enough good things about Pattie. She always finds a nice way to get your attention. She shows great dedication by “efficiently using her time” and “continually improving.” In a quiet corner, one often spots her with music in front, thinking what to do better. It could be her music: markings, expressions, explanations, her communications; hardware: settings, projections, logistics; or showmanship. She is a great conductor to watch in addition to listening to her excellently delivered music. She always looks “so confident” with an eye-catching grin on stage or in classrooms. Her conducting style is very clear, precise, and graceful. She is also a problem-solver and a wonderful team-player. She would go out of her way to help whenever she can. 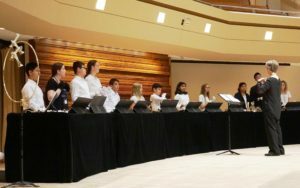 Handbells teach rhythm, listening, and watching the other musicians in an electric and fun way. There is no hiding, everyone is important! In her own words: “Playing handbells is an intriguing adventure, and it will be an invigorating and uplifting class. 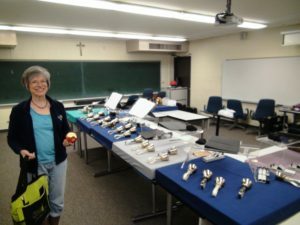 Explore the style, technique, and artistry that it takes to make a beautiful sound with handbells. The OPUS atmosphere is like a greenhouse for growing beautiful music, and more importantly, growing beautiful people. The bonus aspects of composition and improvisation enrich greatly, and the door is sprung wide open for young musicians explore further in our musical galaxy. It catalyzes lasting changes in the young musician’s instrumental finesse.” What a way with beautiful words! Mrs. Barnes is well-loved by her faculty peers, teaching assistants, and students. She has a great way of expressing things in receptive words. People would want to share more ideas and suggestions with her because she is generous in giving compliments. She is never shy in her vocabulary on finding grateful words that wonderfully express “Great Job!” and appreciation which recipients love to hear. 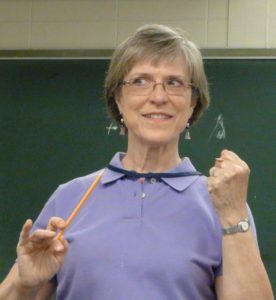 Mrs. Barnes is currently enjoying the completion of 26 years as organist and director of handbell ensembles at First United Methodist Church in Downers Grove. OPUS is really fortunate to have the strongest possible faculty team with professionals like Patricia Barnes to give our students a wonderful musical experience.